Greetings everyone, this is my first review, so any feedback would be appreciated! Apologies in advance for the not-so-great photos.. It’s all I can do with an iPhone and powerpoint.. I thought this would be a wonderful forum to place this in, since there are so many TWSBI fans here, and hopefully some of you may also be very interested in high quality mechanical pencils. 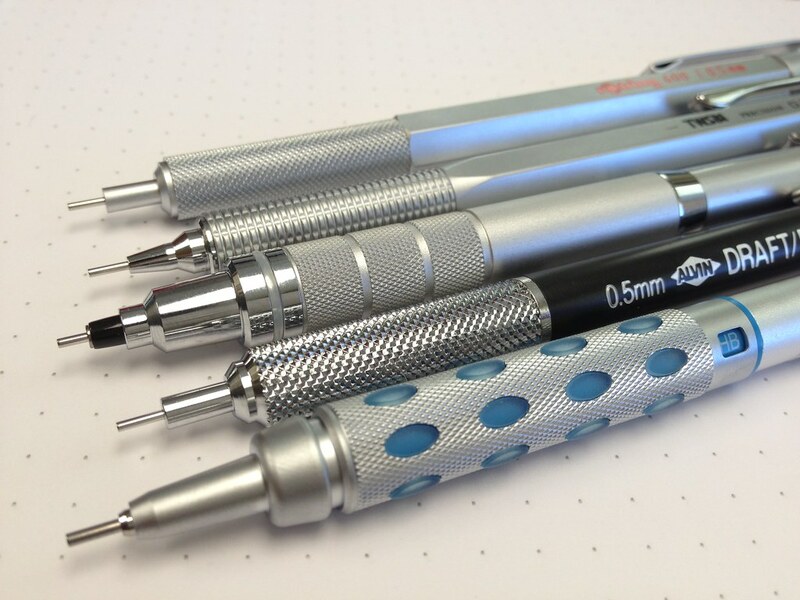 Probably like many of you, I’ve been fascinated by mechanical pencils since grade school. I still remember when my elementary school friend Kurt brought a Pentel Quicker-Clicker to 4th grade and I was, of course, impressed. And extremely jealous. Since then, I’ve gone through a fair number of mechanical pencils, using them primarily for high school / college / grad school problem sets (math, physics, then primarily organic chemistry), which as many of you probably know, requires a sh*t ton of writing, drawing , erasing, re-writing, re-drawing, re-erasing, coffee, falling asleep in the library, waking up disoriented and realizing you’re still in the library, and then continuing on with the problem sets. 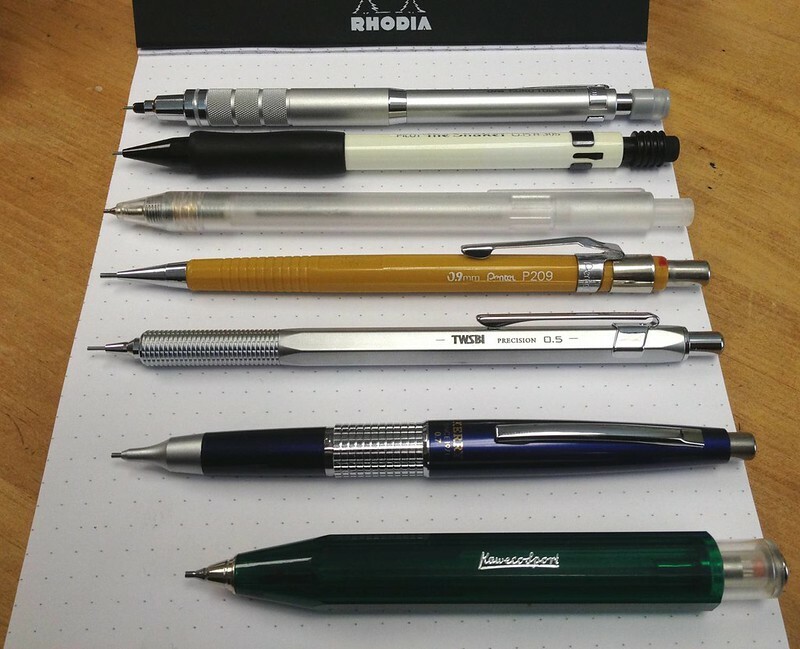 Please note, I am not an architect, engineer, or artist, so although I do have an affinity for drafting mechanical pencils, this review is more geared towards the generalist, non-professional, pencil user. Let’s start with why I chose the TWSBI pencil. I’d actually never heard of the brand until I started getting into fountain pens and started checking out FPN and all of Brian Goulet’s videos. 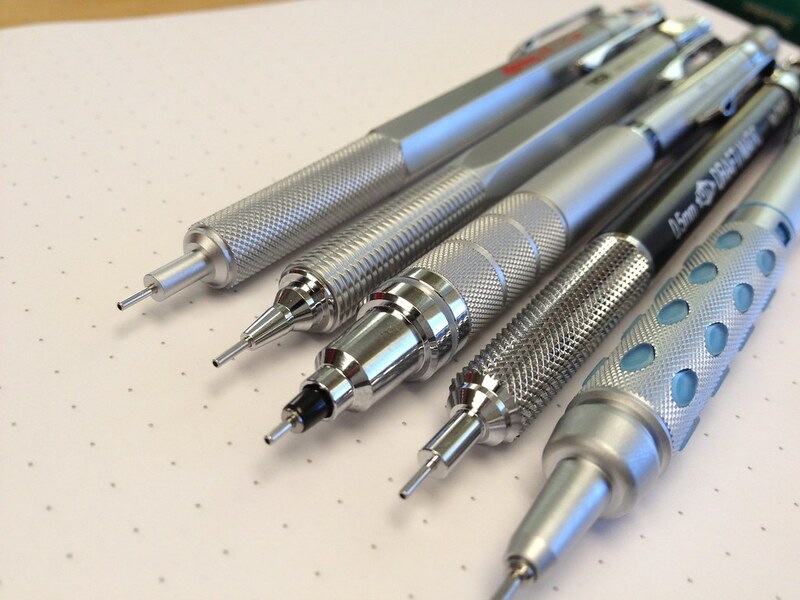 Most other mechanical pencil brands I’m familiar with, but once I started looking at TWSBI for fountain pens, I was just curious about whether they are as consistent and successful with their pencils as they are with their pens, i.e., make a high quality product that is of excellent value for the price. 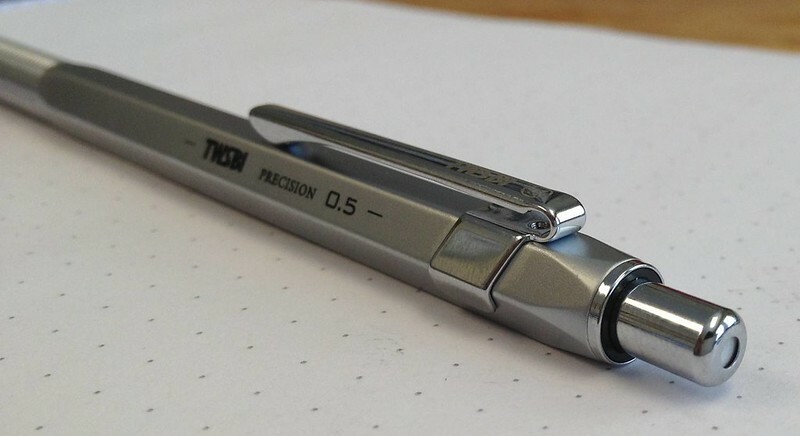 Other than Brian’s excellent video reviews and introductions and the fairly sparse descriptions seen on the TWSBI website, I couldn’t find anything substantial about this pencil using Google. I looked at the wonderful and informative Dave’s mechanical pencil site and still couldn’t find anything. SO I thought it looks cool, TWSBI has apparently been in the business of making pencils for other companies for years (per their website), so let me check it out. Lastly, I didn’t just want to just become another Rotring 600 fanboy. I wanted something that none of the other nerds in the library have seen before. This time I was going to be Kurt from fourth grade. Right out of the box, I was very impressed. 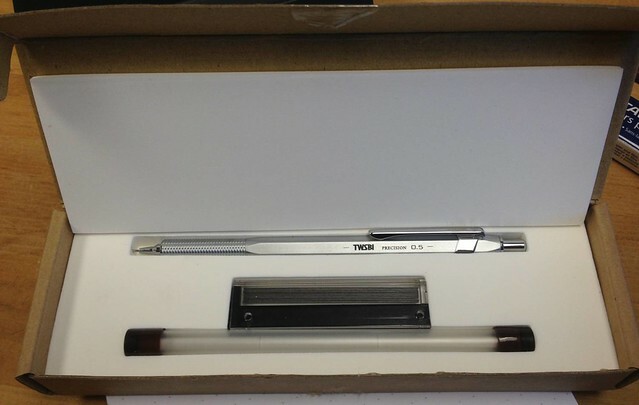 As you can see, pretty standard TWSBI cardboard box (although a bit thinner profile than the TWSBI fountain pen boxes), and inset into foam inside the box is the pencil, a lead container containing 12 extra leads, and 3 extra super-long erasers. 3 leads are loaded within the pencil itself, so I received a total of 15 leads. No other paperwork. Picking up the pencil I found that although it wasn’t very big, it was substantial in weight and evenly balanced. Not point-heavy, and not rear heavy, and center of gravity is somewhere around the middle of the pencil. 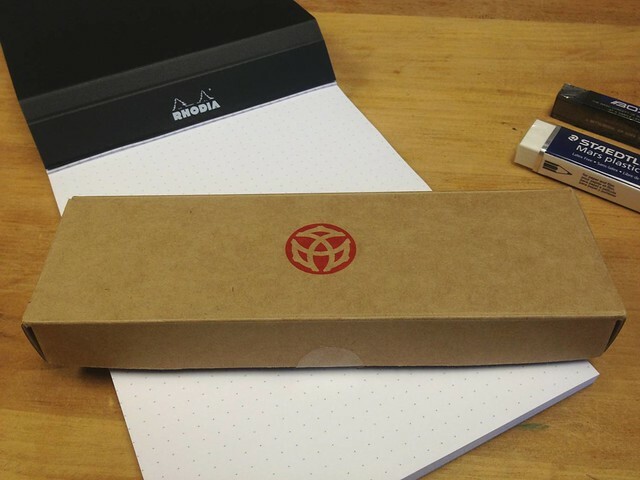 Some people would give extra points to TWSBI for all the extras included in the box. Some would not, because if you’re willing to spend $25 for a pencil, you are likely already a mechanical pencil connoisseur, and therefore also have purchased a high quality eraser and high quality lead. I personally would give points here if I could, because it makes for a wonderful gift box to introduce someone to high quality mechanical pencils and their cool accessories. 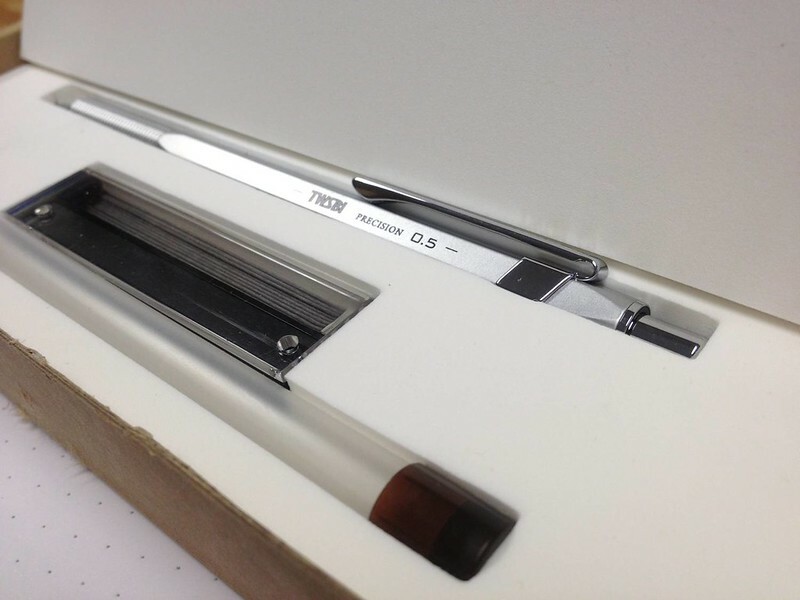 I think this is a wonderful, affordable, and fairly unique gift for a graduating high school senior that’s interested in math/science/art/engineering, for as I know personally, they would be getting a lot of use out of this pencil in the upcoming few years. It just feels solid. Solid like a Rotring. No wobble, no wiggle. All metal construction (including all inner tubing). For $25, that’s a lot of pencil, as most pencils, even in that price range, have plastic insides these days. This pencil is built to last, and I think should last me many, many years. I love reading people gush in forums about their 25 yr lovefest with the Koh-i-noor Rapidomatic 5635 that has since been discontinued… When I'm old, I want to be like them, talking about this TWSBI. This pencil was engineered to last 25 years. Weight: 26g (0.92 oz), it is by far my heaviest pencil. Thickness: 9mm (the hexagonal barrel), 8mm diameter for the grip. (Goulet says 8.8mm and 7.9mm, respectively). 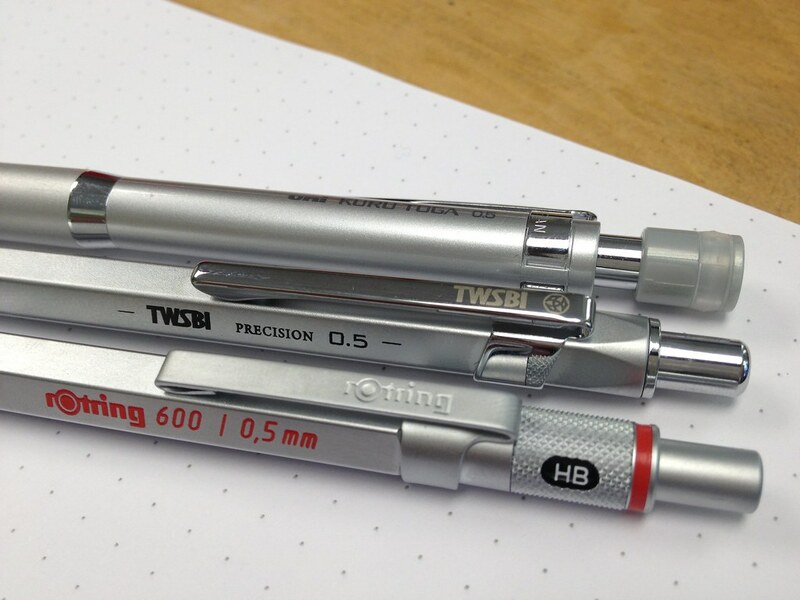 And also note, that for comparison to Rotring 600 (I don't have one), the dimensions of the TWSBI are fairly close. 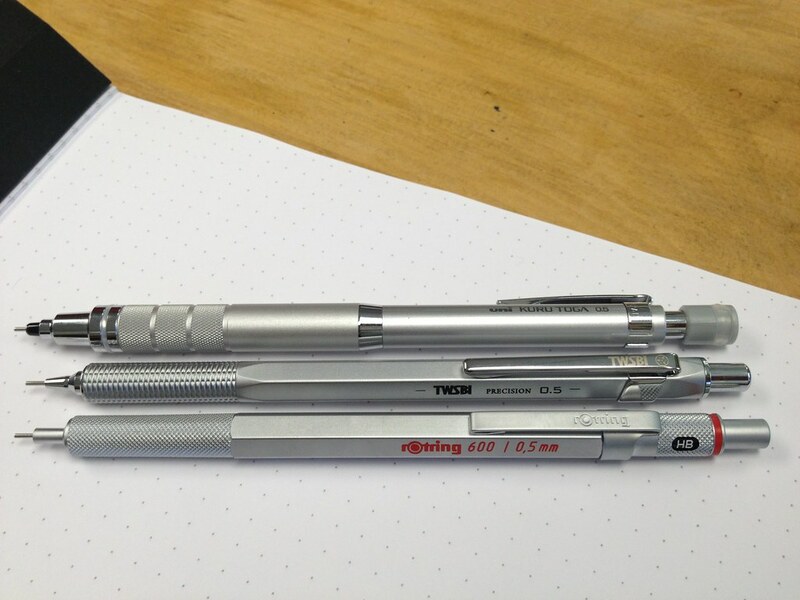 Per jetpens website, the Rotring 600 length is 141mm, max diameter is 9.1mm, grip is 8.1mm, although weight is 18g, which makes it a far lighter pencil than the TWSBI. The TWSBI, despite its heavier weight, still feels like a fine writing instrument, i.e., nimble enough to make quick writing strokes without your hand getting tired. I have yet to have any lead break (many say that is an issue with heavier pens and thinner leads like 0.5s—I think those people just don’t have enough finesse with their pencil handwriting). My initial concern of all-metal construction and the weight of the TWSBI was that the pencil would become too heavy and therefore quite burdensome when writing for prolonged stretches. After two weeks of heavy writing, I haven’t noticed any such issues. What I’ve been pleasantly surprised at is that the weight allows me to significantly lighten the pressure that I’m used to applying when using pencils, and still generate a wonderful dark perfect line. I’ve also noted that relaxing my normally tight pencil grip makes the writing experience even more comfortable and pleasurable (and also leaves no knurled imprints on my fingers anymore! 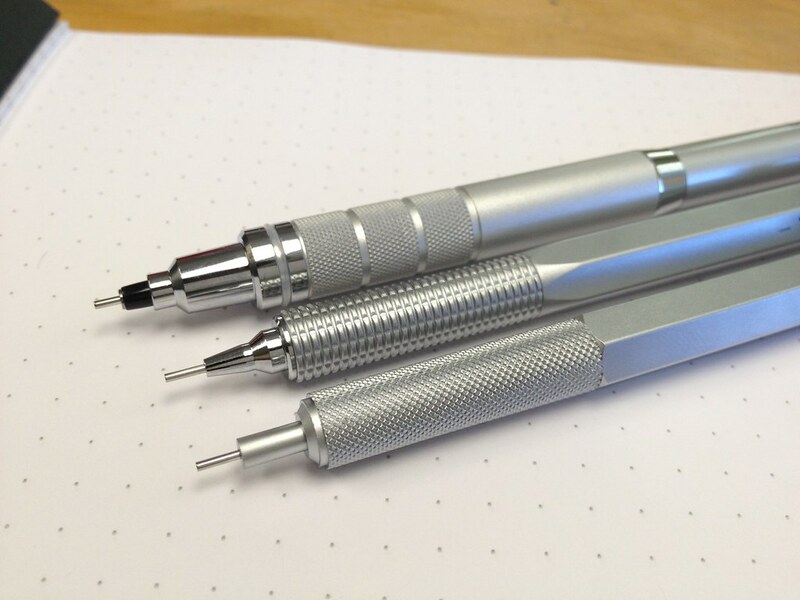 ), as the weight and the knurled grip still prevents the pencil from slipping out of my hand. That means I’m just coaxing the lead left and right and around rather than really having to exert any effort pushing it down onto the paper. Writing with this pencil is so fluid, it becomes much more like a fountain pen experience, so I think it is actually one of the most attractive and unique features of this heavier pencil that is superbly well-balanced. Lastly one of the best things about a well-balanced pencil (rather than a point-heavy one) is that when you drop it (as I tend to do), the pencil is less likely to land on the nib sleeve and bend the sleeve. I take one point off just because I wonder if a slightly thicker grip would improve my handwriting even more for my slightly larger-than-average hands. I guess I already took one point off for that in the Design section, but since I continue to wonder about it, I will continue to subtract points for it. Fixed sleeve (pipe) vs retracting sleeve (pipe). Have your pick, they’re both available in this pencil. I attached some photos of a black retractable sleeve version of this same pencil. 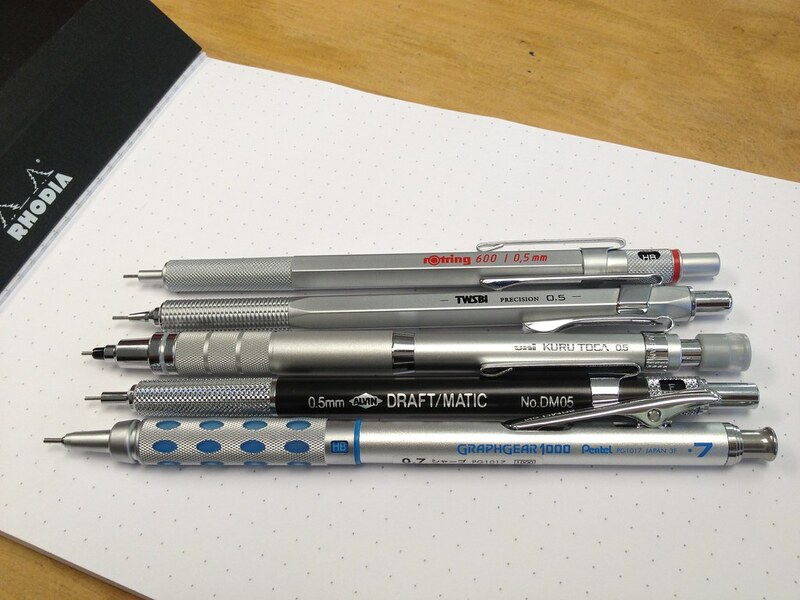 Some people love retractable sleeves as it makes these pencils pocket-friendly and therefore more convenient. Some people don’t love them because of possible increased sleeve wobble, which leads to less precise writing. Also harder/impossible to use for drafting as you'll damage the retractable sleeve against a ruler I guess. One thing to note is that the retractable sleeve length version of the TWSBI is slightly shorter than the fixed sleeve length. 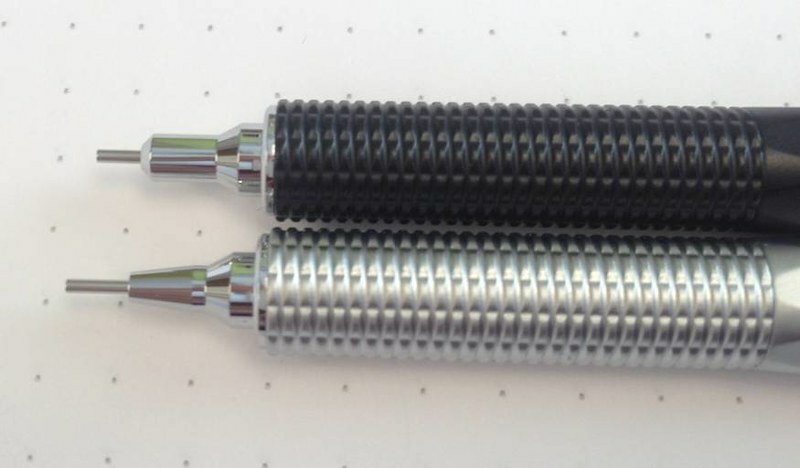 Per Gouletpens website, it is 2.75mm vs 3.88mm, as seen in these pics. I ordered and kept the fixed sleeve length, because I like how it keeps my hand and fingers at a certain distance from the paper and from the point of the pencil. It allows for great visibility of the lead on the paper, and for my size hands, I like it more. The most interesting note to make here is comparing this “nib” to one of my other pencils, the unique Uni Kuro Toga Roulette, which auto-rotates its lead in-between applying pressure on paper. The Kuro Toga therefore keeps a consistent lead point, and is wonderful, but there is a very slight perceptible give on the nib when applying pressure in order to make nib mechanism rotate the lead. I never even noticed this until I started writing with the TWSBI and found what a solid heavy-weighted pencil should feel like, and how wonderful writing with light pressure can be. In order to take advantage of the Uni Kuro Toga rotating nib, I have to use just a tad more downward force to generate the same thickness of line (because it’s a lighter pen) as I do the TWSBI, so in my opinion, the TWSBI is a superior writing pencil for long periods of time, as it requires far less energy and less downward force to be applied to generate a similar line darkness/thickness. If you allow the TWSBI a week of writing in order to slightly change the way you write with a pencil (less firm grip, less downward pressure), you won’t go back to any other pencil. Things I will not really comment on that hopefully someone will chime in on: 1) the included eraser. I use Staedtler Mars Plastic or Uni Boxy almost exclusively, so rarely use the back eraser on mechanical pencils, and therefore don’t want to write about it. I think it’s nice that they have a huge one, which will especially be helpful to students and crossword puzzlers 2) the included lead (graphite). I replaced the included lead with Uni NanoDia 0.5 HB— my all-time favorite lead for hardness, smoothness, and that gives me a more accurate baseline lead to compare it to my other pencils. The mechanism is a standard push top ratchet advance. When I push, I hear a very positive fairly loud “click”, which I like. Very consistent. When depressing the top, consistent pressure is required and the top will depress about 3mm before a click and lead advances. There is no “free” travel before getting to the actuation point for the lead to advance (which I find slightly annoying, and is often seen on other mechanical pencils). Ten clicks will give you around 6 mm of lead. No plastic components that I can see. Gouletpens shows a nice inside view of the pencil. I haven’t figured out how to take this thing apart, as I’m afraid to twist too hard, and I don’t want to use pliers—yes, the inside tubing is screwed on that tightly to the outside case. OK so here is the interesting question and probably the biggest debate—I purchased this for $25 (plus shipping) from Gouletpens. It’s $25 with free shipping on Amazon (when filled directly by TWSBI). But I like Gouletpens and ordered from them because they’re so informative and have great customer service, and I wanted a few other things from them, so I find their shipping cost negligible. On Amazon right now, you can get a Rotring 600 for $24.99 (with free shipping if you’re prime). On Amazon, you can also get a Uni Kuru Toga Roulette for $12.49 - $12.87 (with free shipping if you’re prime). A Rotring 800, however, costs $54.77, which is essentially a 600 with a retractable sleeve (and slightly larger). I think the TWSBI with retractable sleeve, which also sells for exactly the same price as fixed sleeve of $25, is a great deal when compared to other high quality retractable sleeve pencils, aka Rotring 800, which is more than twice the price. I think the TWSBI with fixed sleeve isn’t as well-priced, and should be priced lower. At $20, they would definitely clean up the market and hit that sweet spot of awesome value for quality that the TWSBI fountain pens are known for. At $25, it’s hard to not turn down the Rotring 600 as your first stop to high end mechanical pencils, then try the Uni Kuru Toga Roulette for $13, and then, finally, try out the TWSBI and never return to the others. Then again, these prices are modest compared to FP prices, so I don’t really know why I’m subtracting two points on this section. 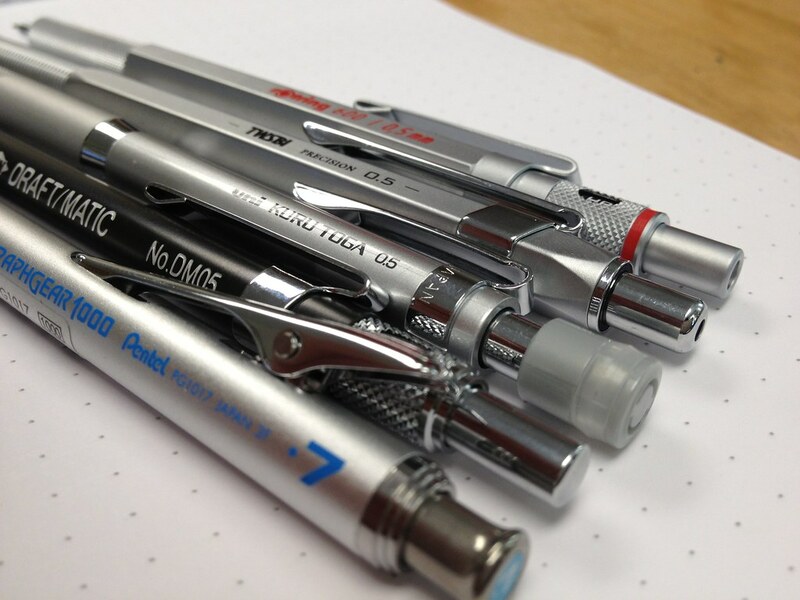 I will, because I’m comparing the TWSBI fixed sleeve to other fixed sleeve mechanical pencils. This is an oustanding mechanical pencil, and should make the top 5 for general mechanical pencils (and probably top 5 for technical/drafting mechanical pencils as well). Go out and get one. 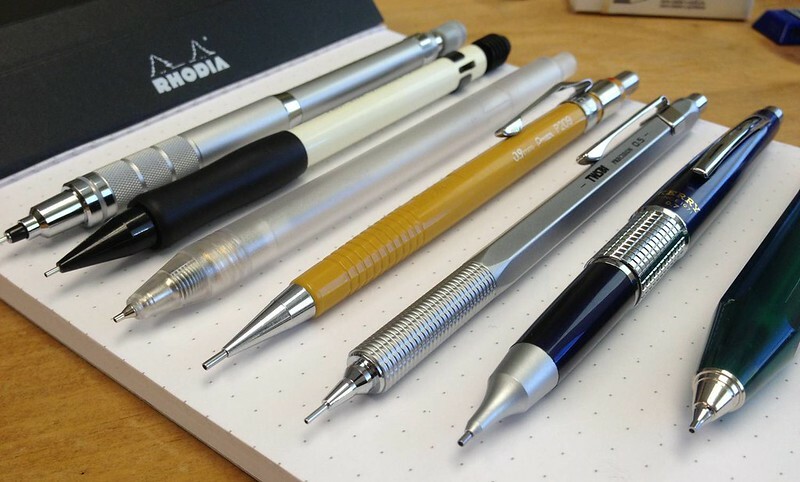 $25 is not a lot for a fountain pen, but it is a lot for a mechanical pencil. But you get a lot for your money. And for fountain pen enthusiasts who need a pencil every once in a while, you will really enjoy the writing experience this pencil will offer. But be forewarned, after a week with the TWSBI, you may not enjoy writing with any other mechanical pencil again. Perfectly balanced for long-writing: notes / drawing / drafting. Gorgeous top-notch construction- will last 25 years. Heavy weight allows you to become more efficient with your hand-writing. Unique—no one else on the block will have one. 1. Really hard pressed to comment on any substantive cons—maybe the grip could be a bit thicker, but I’m wary to really push for that, as a thicker grip may interrupt the precision feeling with the current weight. Maybe thicken the grip and simultaneously drop the weight a bit would be my suggestion for version 3.0? But I don’t know and would have to test it to see if I’d prefer it to the current. Thanks for the detailed review--I've been eyeing these for a while and have still not made up my mind (my mechanical pencil poison of choice has been the Yasutomo Grip500, which I'm not even sure they make anymore) so the additional information is helpful! I especially like the photographs; they're very helpful. Thanks for the kind words R. Good luck with your future decision! As far as I can tell, the Grip 500 appears to be discontinued on the Yasutomo website, although they do still appear available on the 'bay. I can only find the Grip 250 on the Yasutomo / Niji website. 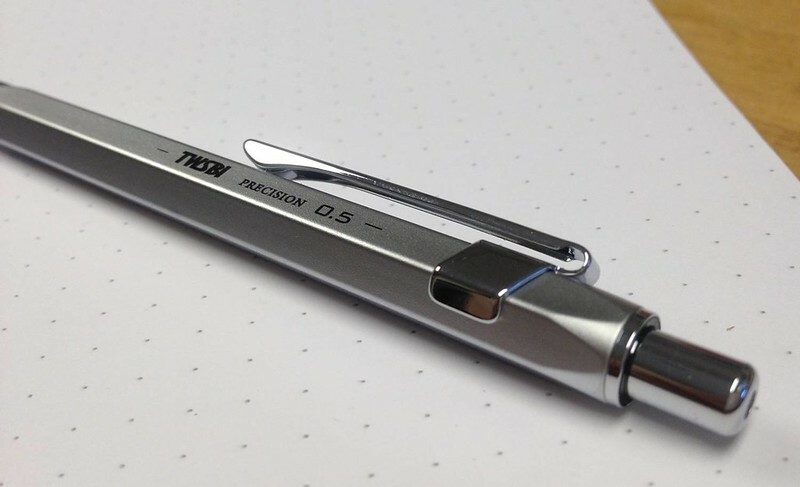 One thing I do want to add is that NedC did write an excellent review of the 0.7mm TWSBI retractable sleeve pencil this past October on FPN. I hadn't actually seen it until just now, so you may find his photos and impressions quite informative as well. Thanks andymcc, appreciate it. Best of luck with your upcoming purchase and hopefully you will enjoy your TWSBI as much as I enjoy mine. I do hope you share your impressions of the pencil as well, as very little appears to have been written about them. Thanks so much for the excellent review! I thoroughly enjoyed it. 1) what's the grip like, meaning is it still smooth and slippery being all metal. ? 2) are you able to comment on the black version ? Is the finish - texture , feel , sensation , different from the silver one ? Would you say the silver is less 'slippery ' ? 2a) how well does the black finish withstand wear and tear? 3) the retractable sleeve is a good feature but when writing or drawing, you are right , the slight wobble can be annoying when you need to be dead accurate. Are you able to comment on how loose or snug the movable sleeve is? Thanks once again for the detailed review. Great review! Keep 'em coming. How do you think this pencil compares specifically to the Uni? TMLee, I will try to go in order. 1) The grip is great- knurled, somewhat smooth but not so smooth/polished as to become slippery. 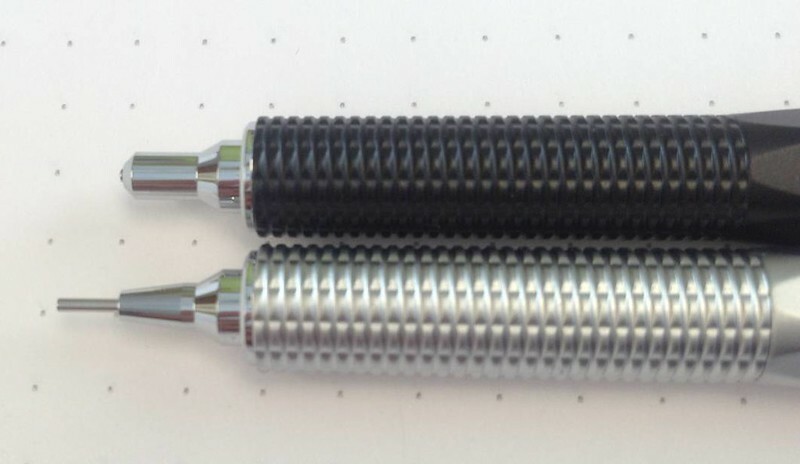 I think NedC does a good job of describing the grip and how it is different from, say, the grip on the Rotring 600 in his review of the retractable sleeve TWBI here. 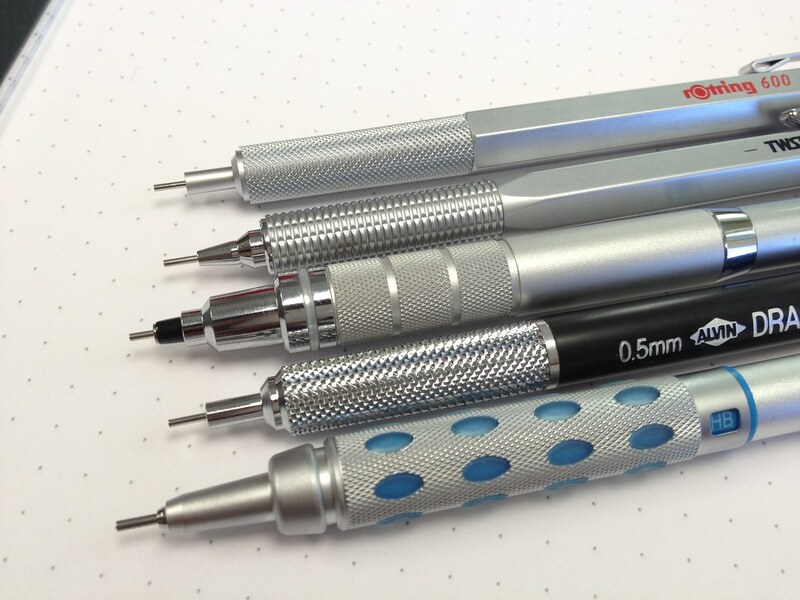 I do agree with his overall assessment of the grip-- I will see if I can post some closer shots of the TWSBI grip, in comparison to my other knurled grip pencils, sometime later this week. 2 / 2a / 3) Unfortunately I can't really comment on the black retractable sleeve TWSBI shown in a few of the photos, since I almost immediately returned it to Goulet-- I just didn't like the shorter sleeve length, which brought my fingers a bit closer to the paper-- so haven't put it through the paces that I did with the silver fixed sleeve TWSBI. What I can say though is that I remember the finish to be similar if not equivalent in quality, texture, and feel. I don't really recall any real nib wobble when handling the black retractable sleeve TWSBI, but unfortunately I can't really comment on it. A good discussion of retractable sleeve MP nib wobble can be found in an earlier FPN post, and looks like the TWSBI was recommended favorably back then. The fixed sleeve version looks promising, especially for draughting and fine artwork. The long shank , etc affords a very good, unobstructed view when pencil meets paper. Glad you enjoyed the review. As far as your question, I'm not sure I can add much more than what I wrote in the second paragraph of my Nib / Performance section, where I specifically compare the TWSBI nib to the Uni Kuro Toga Roulette nib... In my opinion, I've found the TWSBI to be the better all-around pencil. The Uni Roulette is great for writing in print (but don't go too tiny, as then you will notice the nib "wobble" from the kuro toga engine, as others have also noted in this prior post). For everything else-- cursive script, drawing, small print, and maybe precision drafting although I wouldn't know-- I still think the TWSBI will be a more satisfying and luxurious writing experience that will make you smile.. If you put a high quality 2B or 3B (I haven't tried 4B yet as I don't have any) lead into the TWSBI and write in cursive, you can write with such a smooth dark flowing line, with almost _no_ downward effort/pressure, that you will be shocked at how much like a fountain pen this pencil becomes. Yes, it's twice the price of the Uni. Is it twice as good as the Uni? Probably not, but I think if you commit to the TWSBI for a week (and try a few things-- 1) softer / smoother leads of higher quality than what is given in the pencil, 2) looser grip, and 3) less downward force, allowing the pencils weight to do the work for you), you may not want to go back. If you spend only a few minutes with the TWSBI, I don't think you will adjust your pencil handwriting to really take advantage of the difference it can offer. It took me about a half-day before I figured out to write with it without getting tired and without getting the knurled grip imprinted into my fingers. As I mentioned earlier, I do think that for the fountain pen enthusiast, the TWSBI may be a better companion pencil, as you're already used to writing this way with a FP. On the other side, the two main things I love about the Uni Roulette are the price ($12-$13 is ridiculously awesome) and the grip size. I will try taking some photos of both sitting next to each other and post them later this week- perhaps that will also be helpful. Edited by 00aas, 05 November 2013 - 02:44. Edited by terminal, 05 November 2013 - 15:17. Thank you for all the kind words, glad you enjoyed my impressions and I hope it is helpful in future purchases! 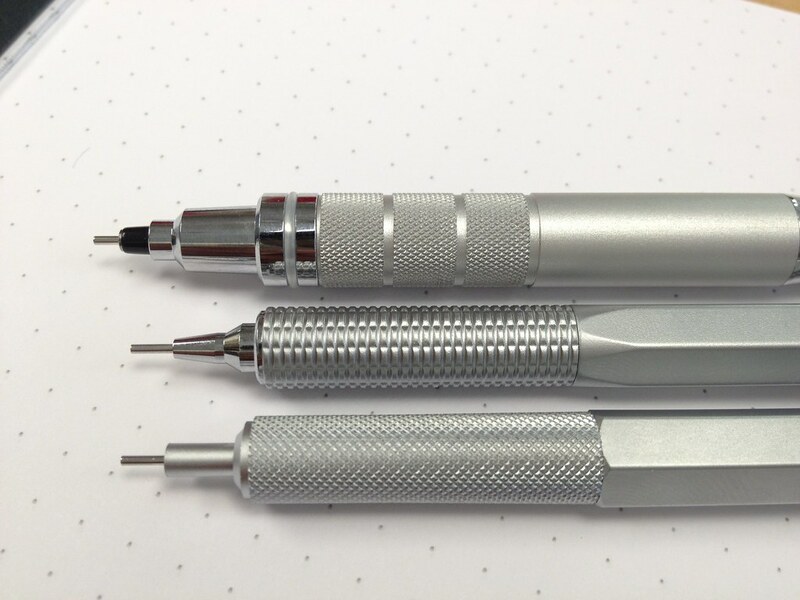 Hopefully that gives you a better sense of size and of the knurled pattern grip of the TWSBI in comparison to other better-known, better-reviewed knurled grip mechanical pencils. 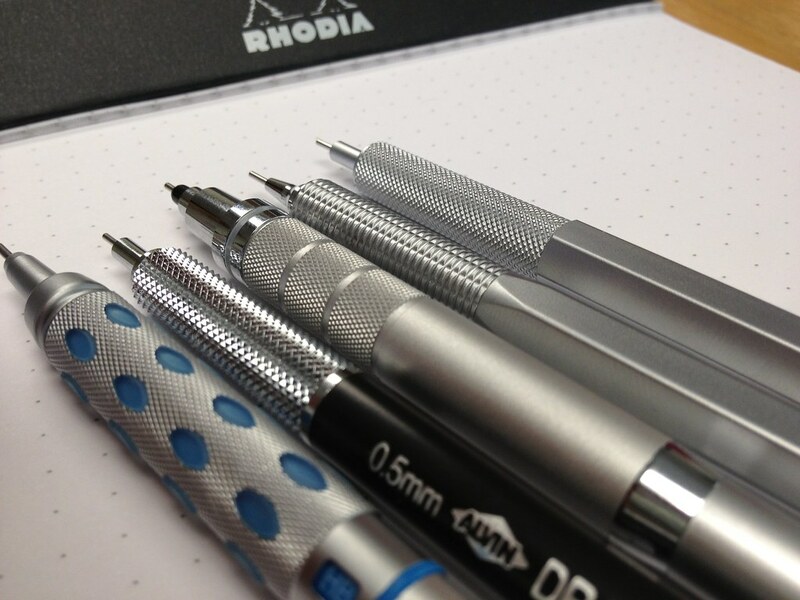 All are fixed sleeve and 0.5mm, except for the Graphgear 1000 pictured (which is retractable sleeve and 0.7mm). As far as price-- all of these pencils are well-priced these days. Rotring 600 is $25 on Amazon, TWSBI is $25 on Amazon and Gouletpens, Uni Roulette is $13 on Amazon, Alvin DM05 is $10 on Amazon, Pentel Graphgear 1000 PG1015a is $14 on Amazon (randomly the 0.7mm was only $10 for a day, so I just decided to get it bc it was so cheap-- kinda wish I spent the extra $4 for the 0.5mm though!). I think your pictures are quite good -- I'd never know they were with an iPhone. Very tasty. I think I am now ready to try it. but the cost is quite high for a mech pencil plus shipping which is FedEx , it becomes too expensive. any other vendors of this pencil that can offer cheaper shipping? The Writing Desk in UK will ship it by airmail to Singapore for £3.19 (£22.35 in total after VAT deduction). No affiliation, but a happy customer. Edited by auto winder, 12 November 2013 - 09:45. I emailed twsbi Taiwan who offered a less expensive shipping option which I accepted. perfectly until... I dropped it on the floor of the laboratory where I worked! The feed tube bent and the pencil was instantly rendered useless to me. I wrote to Rotring and they wrote for me to return it for repair. I sent it abck and never heard from them again. That was about 15 years ago. I'll never buy a Rotring again. Plus I no longer wiat for the return of my pencil. Just a warning.